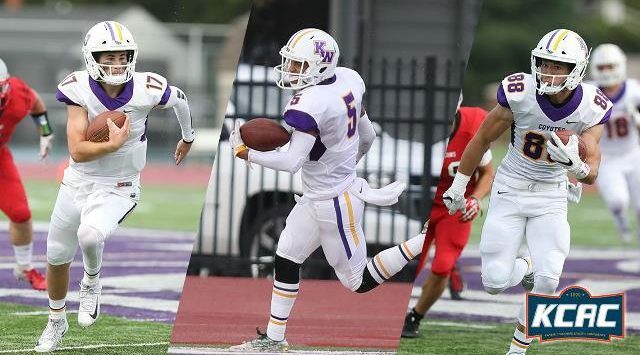 WICHITA, Kan. – Johnny Feauto, Rashaan Broomfield, and Trenton Poe-Evans of (21) Kansas Wesleyan University have earned this week’s KCAC Offensive, Defensive, and Special Teams Player of the Week honors, respectively, the conference office announced Monday. The three student-athletes were selected for their performances on Sept. 8 by a vote of conference sports information directors. 6-1 | 178 lbs. | Jr. | QB | Boulder, Colo. In just one half of football, Johnny Feauto led the Kansas Wesleyan Coyotes to 69 points, setting a new single half scoring record for KWU, and a new single quarter scoring record (35 second quarter points) in KWU’s 83-0 over Friends. Feauto had a part in six touchdowns for the Coyotes, rushing for a 44-yard touchdown, and then throwing for five more TDs, again in one half of football, as he did not play in the second half. For the half he played, he was 10-of-15 passing for 324 yards with 5 TDs, and had 354 yards of total offense, outgaining the entire Friends offense by himself. KWU set the following new school records tonight: Quarter points with 35, half points with 69, game points scored with 83, largest margin of victory 83 points, new Graves Family Sports Complex scoring record with 83 points. 5-11 | 170 lbs. | Jr. | DB | Weed, Calif.
Broomfield had one of three interceptions for the Coyote defense in the game against Friends. He picked off the pass at the KWU 3 yard line as Friends was threatening to score and returned it for what is believed to be a school record 97-yard INT return for a touchdown. His pick-6 helped KWU preserve the shutout victory over the Falcons, the first shutout by the Coyotes since September 26, 2015 and the first home shutout for KWU since September 25, 2010. 6-2 | 198 lbs. | Jr. | WR | Needles, Calif.
Poe-Evans returned a punt 50 yards for a touchdown in KWU’s win over Friends on his only punt return of the game. It was the first punt return for a touchdown for a KWU player since November 3, 2001, a span of nearly 17 years.